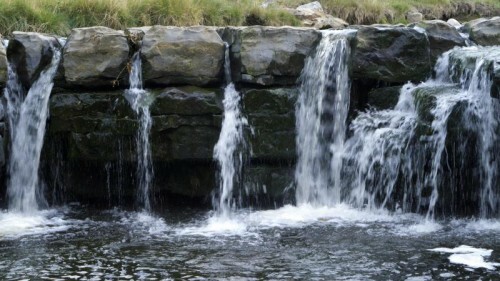 WATER: The giver of LIFE……….OR TAKER!? 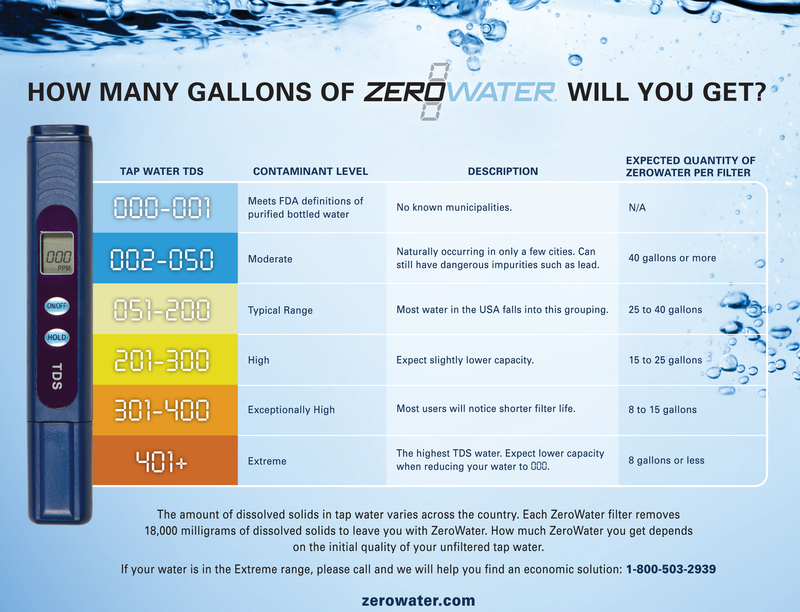 TDS Water Chart. buy ZERO Water filters! They are Great! MORE NEEDS TO BE SAID! CLEAN WATER IS THE MOST IMPORTANT LIVE GIVING H2O! ONTARIO, CANADA, Water routinely – ROUTINELY! – TESTS ABOVE – ABOVE! 600ppm. >600ppm!!! Outrageous!!! Over 400ppm is Extreme, and we are over 600ppm?! This is terrible! This is a disgrace! And that is JUST the ppm! The USA and Canada STOPPED testing for many heavy and toxic metals, to LIE! Babies retarded for life, Babies Dying!!! It is a Scandal! A Cover-Up! The water tests were FAKED! They LIED! Who the Hell is letting this Happen? Take Control of YOUR Water PEOPLE! Take your City Back Before it is too late! It is NOT Rocket Science People! Too easy! You can also take control yourself, by using a RO, or a SERO water filter. Not Britta – Britta LIED! granular charcoal filter takes near nothing out! 12/30/1997 – 06/19/2016. Died too young. Only 18 years old! How? A water borne amoeba – Naegleria Fowleri – that eats the brain. Symptoms: Headache, fever, nausea, vomiting, seizures, dementia, coma, death. Death occurs in days in over 97% of cases. Lauren Seitz Died. due to the CDC water testing showing the deadly disease in the water! The majority of 11 water tests showed Positive for the amoeba Naegleria Fowleri. 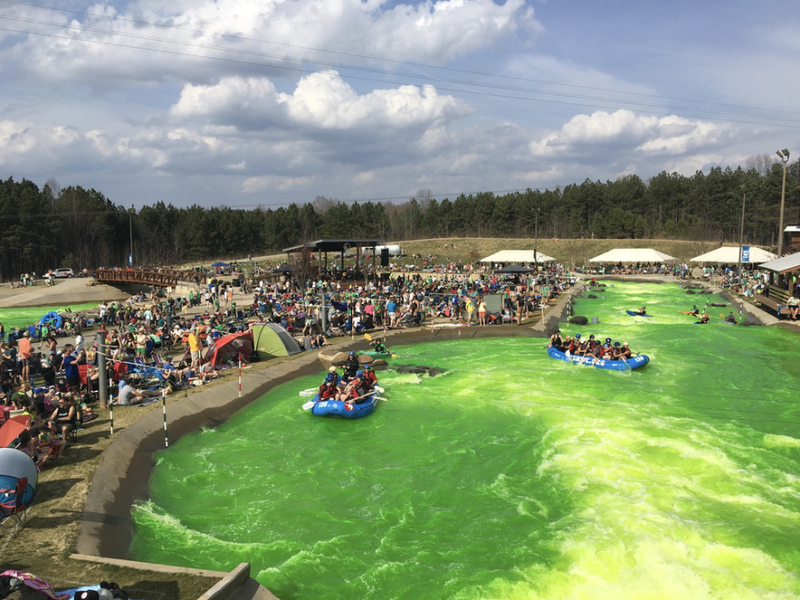 Their website states : “Whitewater activities temporarily suspended” Nothing else. SAD! The TRUTH is the UV Filters they use to “inactivate” the disease, do not work! The TRUTH is the UV Filters lose efficiency quickly and FAIL to kill this disease! The TRUTH is the UV Filters are NOT properly replaced because it costs $$$! 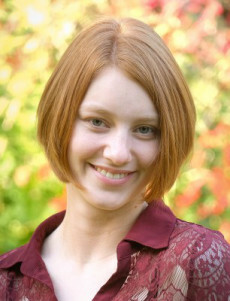 Oh, and it cost Lauren Seitz her LIFE!!! The UV radiation system FAILS to kill this deadly amoeba 99% of the time! This has Lawsuit written all over it! SUE to save others! everyone will read our webpageS and take precautions with ALL water. WATER should be PURE, NEEDS to be PURE, but can we trust it?? Even Brita Water Filters was caught LYING about LEAD removal! and 98.0% of Lead at pH 8.4 that Brita advertised!? !” GET ANGRY PEOPLE!!! to ensure they reduce contaminants, especially lead. Brita LIED!! STOP USING BRITA WATER FILTERS/PITCHERS!!! THROW THEM OUT! Instead, buy a “ZERO” water filter and pitcher. ZERO passes the NSF Certification! 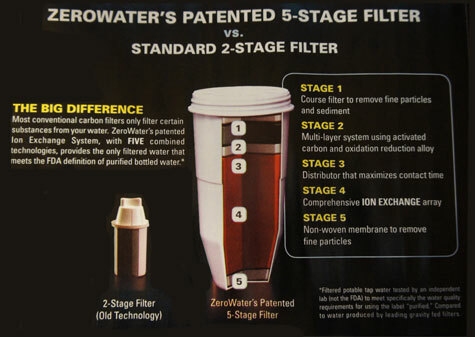 Note: ALWAYS replace the Zero Water Filter at 0.006ppm! 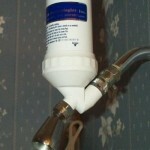 A Certified Water Filter is a MUST! !…WAKE UP PEOPLE! **!…WAKE UP!**! only 10-15 fills, or about 1 month per one person, is a lot of $$$. However, how much is you LIFE and Quality of Life, worth??? Uh huh… Whatever it takes, GET THE LEAD OUT!! and buy/grow ORGANIC! Many people are getting sick, or dying, because of toxic and lead filled Water/food! USA, Canada, UK, EU, Japan, China, Russia, Middle East, etc. All have toxic water!!! What can we do about this? What tests are there?? What questions do we ask??? 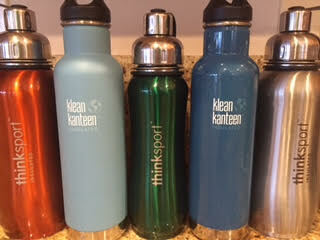 Use Stainless Steel water bottles only!! Note: NEVER use artificial sweeteners! They are more harmful than sugar! Sweet’N Low (saccharin), Acesulfame-K potassium, Agave Nectar, Neotame, Xylo. High Fructose Corn Syrup, Cyclamates, Neohesperdine, Thaumatin, and more. First, get Educated. Remove the brainwashed mindset that any water is OK.
You are NOT Superman. You are NOT immune to short or long term illness. We are ALL weak, frail, vulnerable Human beings, who MUST learn the TRUTH! Get “unbrainwashed”. Get rid of Apathy. Lose the Laziness! Make a “research project” into WATER. Get Educated!!! Free water tests are available. 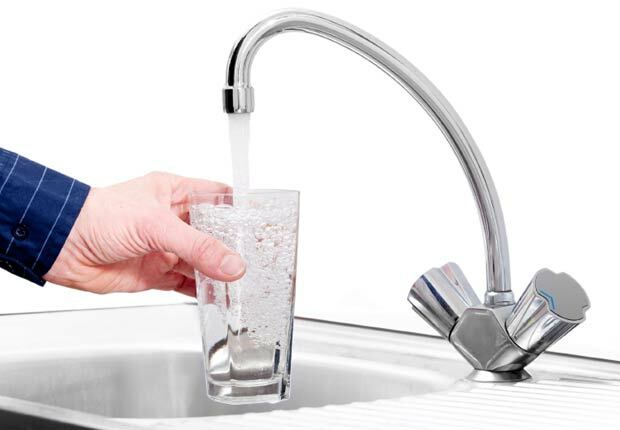 Second, Well water, Ground Water, Lake Water, Artesian Water, Tap Water. Find out the differences, and what is in the water you consume. 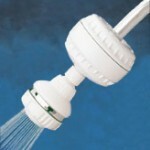 Showering is also a major concern, as we absorb what is in the water. Immediately, you can purchase a charcoal “shower filter”. Do it! There are many companies that will do free water analysis, or DIY. Most water will show toxic levels of lead, chlorine, fluoride, Manganese. Other toxins and viruses and feces, and chloroform can show up. Very dangerous. Especially to the young and elderly. Identify the dangers to be removed! the Water Quality Association (WQA) to meet or exceed NSF/ANSI Standards. But even ZERO does not take out all of the toxic elements. Others Toxic elements such as Manganese, Fluoride, are NOT taken out. To do that, you need a special system: OSMOSIS. and in fact are INABSORBABLE!!! The human body CANNOT absorb these as nutrients. and then and only then, can minerals be absorbed by the Human Body!!! Understand?! Also, an “Iron” Frying pan does NOT add more iron to your food! The mineral form of iron is inabsorbable. Understand?! 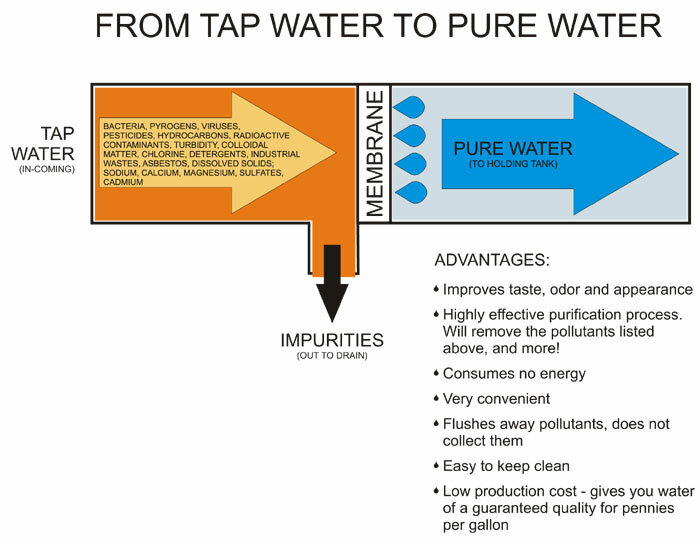 Third, What water treatment system is good for you! 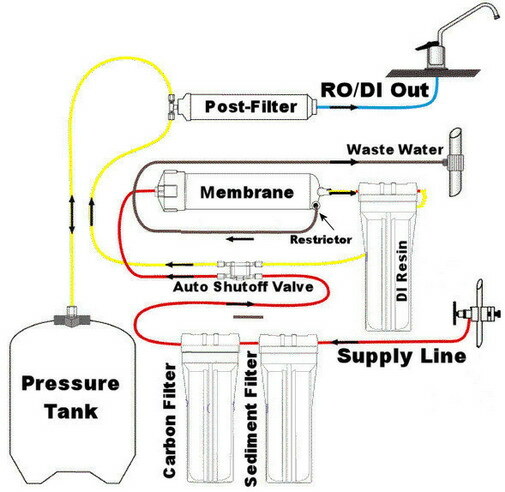 Reverse Osmosis Systems, R.O. for short, are all very different/confusing. You want the higher quality, maximum multi-stage system. One, it kills viruses and parasites. Ozone is a very important operation, if you need these removed. 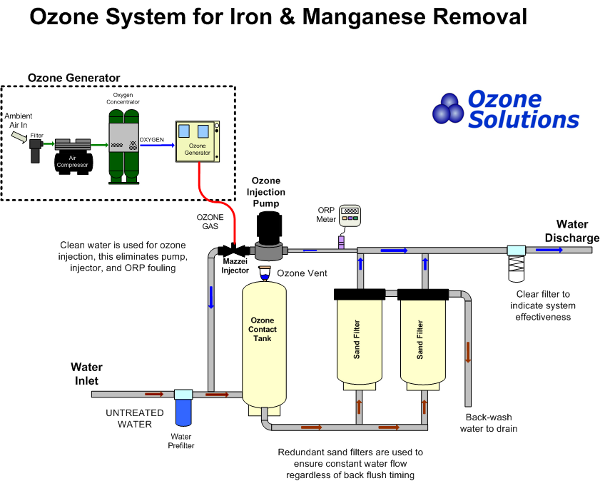 In addition to being used as a disinfectant, ozone is used for iron and manganese removal because ozone can facilitate their removal. Ozone will oxidize these metals from dissolved forms to particulate (oxidized) forms. Fe to FeO2, Mn to MnO2. Once these metals are oxidized, they can be more easily filtered. Would you let me put Hydrofluosilicic Acid in your glass of water to drink? come on, just a bit? Then you have guessed the correct answer. NO to Hydrofluosilicic Acid. HFSA is added to many communities and cities drinking water, but has not gone through the proper testing. I am very much not a conspiracy theorist, but I had to dig deeper into this. HFSA DOES make people in general more docile and controllable. HFSA is a poison, and can cause death. HFSA was used back in WW2 on POW’s. HFSA is used to make Sarin Gas. HFSA can cause cancer, alzheimers, heart disease, thyroidism, retardation, and more. 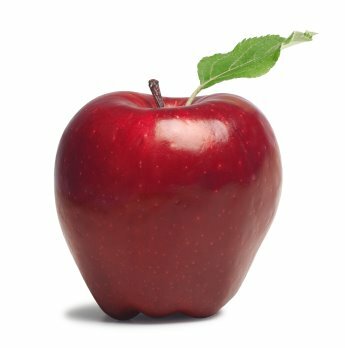 Do you know the saying: “An apple a day keeps the Doctor away”? No? Ya! Fake. Made up by the American Apple Producers to sell more apples. Did learning that truth ever burst my bubble. But the lies go on. Read further down the Post about Vitamins, Minerals, Water filters. And NO, charcoal filters do NOT take out HFSA. What is this HFSA you ask? Answer: Fluoride. Our qualified and experienced staff at SalvationCanada confirm this true. Fluoride does NOT prevent cavities. In fact, most of Europe does not fluoridate their water and their teeth are just fine, or even better than Canadians and Americans. to cause symptoms. Read the warning label? “If swallowed, call a Poison Control Center immediately”! AHHH!! 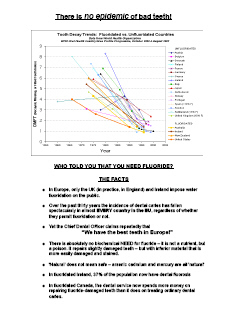 Fluoride Poisoning needs to be taken seriously. 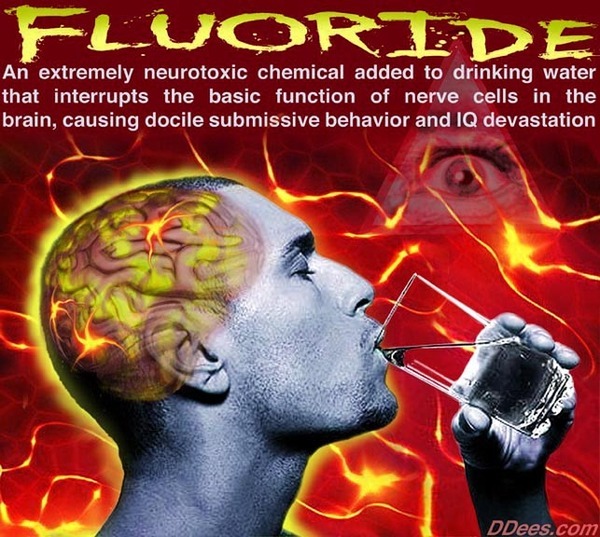 So just like the apple a day is a LIE, so is adding Fluoride to water, a LIE. Only osmosis will take it out. Sorry to burst your bubble everyone. But as we take a look at each issue with our Governments, more and more are evil lies. Why? Control, Power, Greed, and on and on. Making us slaves. That is why we need the TRUTH in our lives. That is why we need the JESUS in our lives. Read on, wise people. Read on. There is so much more to share…so much Ultra Important Information. Become a Member of Salvation Canada Today! We need YOUR Support. our own dime. Sacrifice, and more Sacrifice to give YOU, the Truth! Thank you for Donating, right now.